NON-GEEKS STAY AWAY, MY POSTS WILL GIVE YA' CANCER. 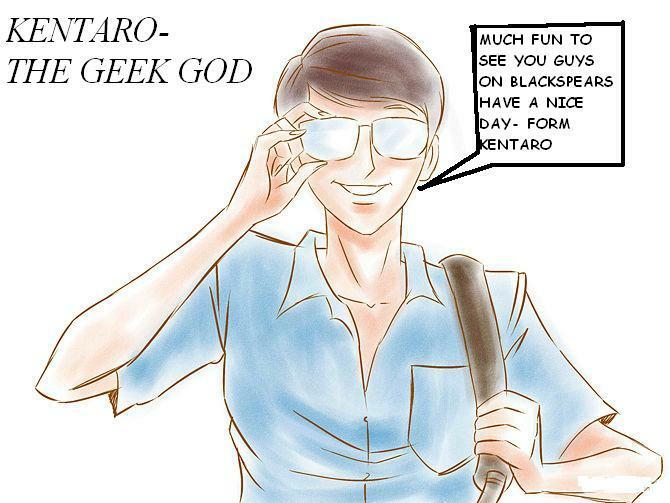 kentaro geek mado god king here. so i made up this image to show my lovemore char. ambitions. Keiryu One does not simply upgrade to God level. You lack the necessary God Powers. The only God/Admin like beings on Blackspears are Robin, Akira and Me. After that come the Demi-Gods/Mods Rang and Soham. And above use is the Creator/Creator...Aka: SimMan. so that makes me the god over there, sorry to say, but poor logic in the very least. and ya when you mentioned ganesha, he is the real powerful god. i become the demi-god in front of him. BUT NOT IN FRONT OF YOU, DARNIT. Keiryu If you are a "God" on that other place then that is up to you i keep telling you that here you are no God and neither are you in "Real Life" as you put it. It has nothing to do with my logic it's simply truth i never said anything about any other place. gods reside real-world, in their real place, JUST LIKE ME. Keiryu Nope that is where you are wrong our powers are the only REAL powers. You have nothing. If we talk "Earthly" gods then you have way to many competition since all you are trying to be as "Geek God" is the God of Intelligence/Wisdom/ Knowledge. PS: On a random note INSANITY actualy has Gods for example Mania/Manea and Lyssa but it still is less competition than you would have. but tempertures soartoo high, almostas high as 49 degrees.